Super Bowl power outage: What went wrong? NEW ORLEANS Super Bowl XLVII's dramatic second half was made more so by a power blackout, which halted play and left millions of TV viewers in the dark. The biggest pro football game of the year was in limbo for more than a half-hour Sunday night because of the outage, which plunged parts of the Superdome into darkness, with no clear explanation as to why. The Baltimore Ravens were leading the San Francisco 49ers 28-6 when most of the lights in the 73,000-seat building went out with 13:22 left in the third quarter Sunday night. CBS News correspondent Armen Keteyian was just finishing an interview in the NFL control room with the league's Senior Vice President (Events), Frank Supovitz -- the man in charge of the NFL's entire Super Bowl Game Day operation -- when power went out. "We were talking about a halftime timing clock when everything changed," Keteyian told "CBS This Morning." 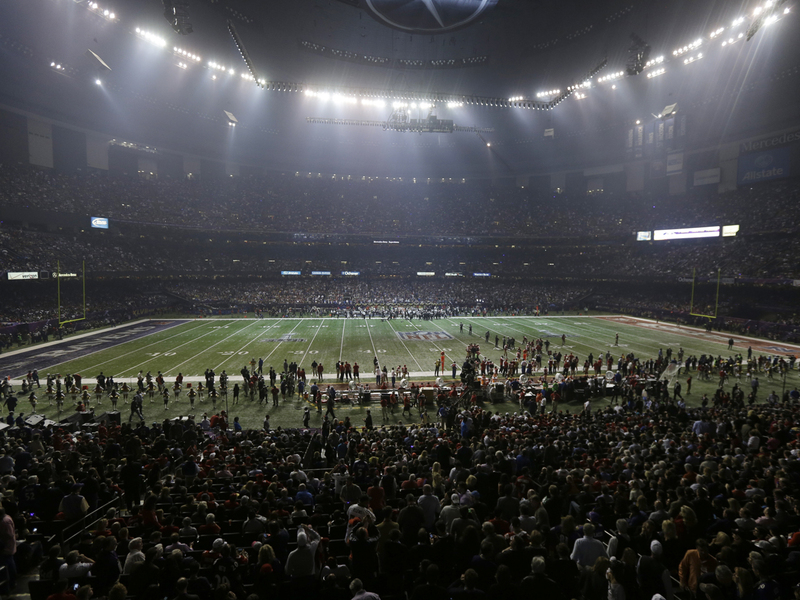 "All right, we lost lights," said Supovitz, as rows of lights in the Superdome shut down. In the control room there was no panicking, said Keteyian, but there there was a certain amount of confusion. Jim Nantz, who was calling the game for CBS Sports, lost communication. "We were out, we were completely dark," Nantz told CBS News correspondent Jeff Glor. "I couldn't see chart boards or anything. I wasn't even sure if they'd be able to restart the game." Play did resume, but it took 34 minutes. And when the power came back, so did the 49ers, coming back from a 22-point deficit to a squeaker 34-31 loss to the Ravens. About two hours after the game, officials revealed that an "abnormality" in the power system triggered an automatic shutdown, forcing backup systems to kick in. But they weren't sure what caused the initial problem. New Orleans Mayor Mitch Landrieu called the power outage "an unfortunate moment in what has been an otherwise shining Super Bowl week for the city of New Orleans." "In the coming days, I expect a full after-action report from all parties involved," he said. Auxiliary power kept the playing field from going totally dark, but escalators stopped working, credit-card machines shut down, and the concourses were only illuminated by small banks of lights tied in to emergency service. Most fans seemed to take the outage in stride, even starting up the wave to pass the time. "So we had to spend 30 minutes in the dark? That was just more time for fans to refill their drinks," said Amanda Black of Columbus, Miss. A joint statement from Entergy New Orleans, which provides power to the stadium, and Superdome operator SMG shed some light on the chain of events, which apparently started at the spot where Entergy feeds power into the stadium's lines. The problem occurred shortly after Beyonce put on a halftime show that featured extravagant lighting and video effects. "A piece of equipment that is designed to monitor electrical load sensed an abnormality in the system," the statement said. "Once the issue was detected, the sensing equipment operated as designed and opened a breaker, causing power to be partially cut to the Superdome in order to isolate the issue. ... Entergy and SMG will continue to investigate the root cause of the abnormality." The FBI quickly ruled out terrorism, and the New Orleans Fire Department dismissed reports that a fire might have been the cause. Auxiliary power kept the playing field and concourses from going totally dark. On the CBS broadcast, play-by-play announcers Jim Nantz and Phil Simms went silent. Sideline reporter Steve Tasker announced to viewers a "click of the lights" as the problem. Later, the halftime crew anchored by host James Brown returned to fill the time with football analysis. Brown said a power surge caused the outage. The failure occurred shortly after Jacoby Jones returned the opening kickoff of the second half for a 108-yard touchdown, the longest play in Super Bowl history and pushing the Ravens to a commanding lead. But when play resumed, the momentum totally changed. The Niners scored two straight touchdowns and nearly pulled off a game-winning drive in the closing minutes. They had first down inside the Ravens 10, but Baltimore kept them out of the end zone to preserve the victory. The blackout, it turned out, became more of a footnote than a spark to what would have been the greatest comeback in Super Bowl history. "It just took us longer to lose," moaned San Francisco linebacker Ahmad Brooks. No one could remember anything like this happening in the title game, but it wasn't unprecedented. Just last season, the Niners endured two power outages during a Monday night game against the Pittsburgh Steelers at Candlestick Park. "I didn't know what was going on," San Francisco safety Dashon Goldson said. "I just tried to keep my legs warmed up." The Ravens felt the delay turned what looked like a blowout into a close game. "It really hurt us. We had lot of momentum," fullback Vonta Leach said. "We were rolling. That 35- or 40-minute wait, whatever it was, hurt our momentum as far as what we were trying to do. But we came out on top and that's all that matters." Safety Ed Reed said some of his teammates were worried that the game would turn when the lights came back on. "The bad part is we started talking about it," he said. "Some of the guys were saying, 'They're trying to kill our momentum.' I was like, 'There's two teams on the field.' But once we started talking about it, it happened. We talked it up." The public address announcer said the Superdome was experiencing an interruption of electrical service and encouraged fans to stay in their seats. Players milled around on the sidelines, some took a seat on the bench, others on the field. A few of the Ravens threw footballs around. Officials gathered on the field and appeared to be talking to stadium personnel. Finally, the lights came back on throughout the dome and the game resumed. "Let's go!" referee Jerome Boger said to the teams. The NFL said stadium officials were investigating the cause. "We sincerely apologize for the incident," Superdome spokesman Eric Eagan said. Once the game resumed, CBS said all commercial commitments for the broadcast were being honored. The network sold out its allotment of advertising at $3.8 million per 30-second spot. "We lost numerous cameras and some audio powered by sources in the Superdome," said Jennifer Sabatelle, vice president of communications for CBS Sports. "We utilized CBS' backup power and at no time did we leave the air." The outage provided a major glitch to what has largely been viewed as a smooth week for New Orleans, which was hosting its first Super Bowl since 2002 and was eager to show off how the city has rebuilt since Hurricane Katrina. Monique Richard, who is from the north shore of Lake Pontchartrain, had tickets in the upper deck. "My exact words on the way over here were, 'I hope this goes off without a hitch,' because the city just looked so good, they were doing so well, the weather so good everything was kind of falling into place," she said. New Orleans was once a regular in the Super Bowl rotation and hopes to regain that status. Earlier in the week, the host committee announced it will bid on the 2018 Super Bowl, which would coincide with the 300th anniversary of the city's founding. The 38-year-old Superdome has undergone $336 million in renovations since Katrina ripped its roof in 2005. Billions have been spent sprucing up downtown, the airport, French Quarter and other areas of the city in the past seven years. "Everything shut down," said Carl Trinchero, a 49ers fan from Napa, Calif., who was in the Superdome. "No credit cards, vending machines shut down, everything shut down." Trinchero said it may have affected the momentum of the game but, given that the Ravens survived the 49ers comeback, "It didn't affect the outcome." Joked Doug Cook, a Ravens fan from New Orleans: "They didn't pay the light bill." Still, he admitted to a fleeting fear when the lights went out. "I started thinking it was a terrorist attack. I was a little nervous," he said. In the French Quarter, fans didn't appear much concerned with the power outage or delay in play. "If we can blame Beyonce for lip syncing, we can blame her for the power outage," said Gary Cimperman of Slidell, La., with a laugh as he watched the second half of the game from a bar. "Or maybe Sean Payton called in the outage, bountygate part two."